The RFBAQ General Meeting on Sunday 31st March saw Commissioner Carroll, Deputy Commissioners Wassing and Smith and the Commissioners Chief of Staff discuss the planned restructure, lack of consultation and a way forward. The RFBAQ provided the QFES with 5 discussion points on the Wednesday prior to the General Meeting and these same 5 points were discussed in depth on the Saturday by the elected representatives before the Commissioner arrived on the following day. The 5 points received unanimous support from the elected representatives and led the discussion on Sunday, there was good and friendly discussion back and forward and a general agreement from both parties regarding the now 4 points as consensus was reached that the 1st two points could be rolled into one. Since then the RFBAQ President and General Manager met with the Commissioner, Deputy Commissioner Wassing and Assistant Commissioner McCormack last Wednesday in Kedron where a format was agreed that had the RFBAQ position on the left column, the QFES position in the middle column and the agreed outcome on the right column. This would be a very easy to read and understand document that would provide the platform for ensuring the agreed outcomes were followed through into action. The outcome that the RFBAQ would like to see and why for point 1 is that there was no consultation regarding the reporting restructure before the announcement on the 4th March, this then led to the realisation that there is actually no agreed process or procedure to guarantee consultation or engagement. We proposed an agreed process to trigger prior engagement with brigade volunteers, brigades and the RFBAQ. An example would be – ‘RFSQ/QFES want to look at amending the terms of reference for the Strategic Committees – this would go to the RFBAQ SEM’. ‘RFSQ/QFES want to look at allowing the Commissioner to dismiss a brigade member from membership of a brigade – this would require all brigades to be supplied with easily understandable and accessible information that they can discuss at brigade level, RFSQ Area Office staff would be supplied with briefing materials to be able to answer brigade questions locally and this would culminate in a quick series of Q&A sessions in times and places that are convenient to brigade volunteers (like Legal Status)’. There are obviously many differing types and styles of engagement/consultation in between. This would be acknowledgement that as unincorporated associations that truly reflect individual community needs, brigades are different to any other part of QFES and need to be consulted/engaged across a longer term with more information needing to be supplied so that the brigades can make informed local decisions. Point 2 is that place-based decision making is paramount to good community defence. The RFBAQ would see, ahead of the future legislative change, a simple workable command and control tactical directive, that clearly defines responsibility of Rural Fire Brigades, State Emergency Service and Fire and Rescue Service. One of the greatest worries regarding the restructure was brigades believed that they are already losing the ability to remain in control of fires in their own areas and that non-place based incident controllers did not know how fire travelled locally and that fires ran longer and burnt out more country than necessary due to this disconnect. The RFBAQ are pushing to have a simple directive sheet produced that condenses the many pages of doctrine into a usable tool that brigades understand and outlines a 1st Officers rights and responsibilities in fighting bushfires and meeting community defence needs in and out of their brigade areas. Point 3 is End State - Where are we going? How are we going to get there and will changes enhance the abilities of brigades to determine and meet their current or future community defence needs? The 21 CID’s do not give an understanding of the direction and steps the department is taking and how it will affect brigades and their ability to defend their communities. The RFBAQ will work with QFES to develop a blueprint outlining key challenges and initiatives proposed for bushfire management and community defence. Point 4 is on the back of a huge bushfire season where brigades were never found wanting in going forward to defend the State that was followed by brigades providing a huge amount of support in flood cleanup. Will brigades continue to receive increasing support from Government and QFES in the upcoming budget and will this translate into increased numbers of yellow trucks, slip on units, Rural Fire staff and direct brigade support? 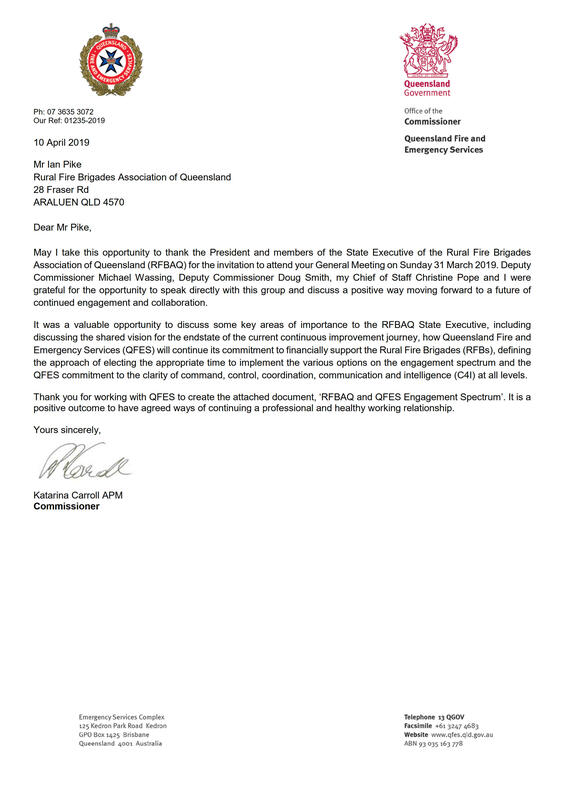 Please take the time to read the letter from the Commissioner and the agreement between the RFBAQ and QFES.